Save time in maintaining your golf cart batteries with a new Battery Filling System. These BWT (Battery Watering Technologies, formely Battery Filling Systems, a.k.a. BFS) are designed for various golf cart and utility vehicles model. This single point battery filling system may also be configured for use in RVs, boats and electric vehicles that use flooded-cell lead acid batteries. Even though many lead acid batteries claim to be maintenance free, they still require minimal routine maintenance. Battery electrolyte (water & acid combination) naturally gases and evaporates from the batteries during charge cycles, as well as during normal use. Hotter climates will cause battery electrolyte levels to evaporate more quickly, so keep a close eye on your water level. Battery filling bottles (offered elsewhere in this website) allow you to perfectly fill each battery cell, but some of us need to complete this task faster. The Battery Filling System offered here will cut your watering time of 15 minutes down to a matter of seconds. Now that is maintenance free. The watering system is very easy to install on your golf cart in a matter of minutes and is available in several custom sizes depending on the year and model of your car. Remove your existing cell caps and replace with BFS patented cells caps. Each cap has a built-in electrolyte indicator which indicates if the cell is low or properly filled, a specific gravity measuring port, a water trap to prevent corrosive hydrogen gas from moving cell to cell, and snap lock floats which can be ordered to fit most battery brands. Cells: What exactly is a battery cell? Each water fill hole in your battery top represents a cell. Each cell for lead acid batteries is approximately two volts per cell. You have multiple cells per battery depending on the voltage of the battery. For example, a six volt battery has three cells representing two volts each for a total of six volts. An eight volt battery will have four cells, a twelve volt battery will have six cells, and so forth. Be sure to examine the numbers of cells per battery as well as your total number of cells in your entire battery bank prior to ordering any BFS system. This will help us ensure we provide you with the correct kit for your application. your batteries will become virtually maintenance free. No more harmful corrosion build up on your batteries. Eliminate unsightly and potentially dangerous battery acid spills. Prevents exposure to dangerous battery acid and vapors. No more damaged or stained floors. Add to the life of your batteries by ensuring each battery is refilled accurately and efficiently. Save time: fill your batteries from a single connection, never remove another battery cap. Take care of routine maintenance without having to remove caps. Diagrams: To help ensure we provide you with the correct kit for your application the first time, we now have added many drawings of common golf car & utility vehicle battery configurations for your review. Please take the time to review the applicable drawings and compare carefully to your battery configuration prior to ordering. If your battery bank does not look exactly as shown in the drawing, please call us at 1-800-328-1953 (828-963-6775) for help. Please click "Related Documents" just below the price above to view the applicable battery configuration drawing as an easily viewable .pdf file. At this time, we do not have a complete set of drawings for every kit shown in the option menu. We are in the process of acquiring the missing drawings and they will be added in the near future. Battery Types & Floats: Let's talk a minute about compatible battery brands for each kit we offer. We'll have to first define floats and how they differ per battery brand to properly advise you on the correct kit for your applictaion. Most of the drawings listed above are shown with some type of Trojan brand battery. If you don't have Trojan brand, that is not a problem, because many of our kits are compatible with other battery brands as well. It really depends on the float length. A float is the lower air-filled portion you see pictured above hanging down from the BFS cap. This float lowers and rises with the height of the water (electrolyte) level in your battery cells. Different batteries require a different float length to water each cell properly. Please review the float listing below to determine if your battery type is compatible with the Trojan models mentioned above. What does this mean? Let's take an easy example. If you have an E-Z-GO 36V TXT model, it is shwon above from the factory with six 6V Trojan T-105 batteries. However, many people do not always install Trojan as the replacement down the road when the batteries wear out. Let's say, you've installed a GC15 6V batteries from East Penn Deka. From the float listing above, you can determine that the T-105 and the 6V Deka equivalent use the same float, therefore, use the same BFS kit. This is a lot of information to digest, so please call if you have any questions. 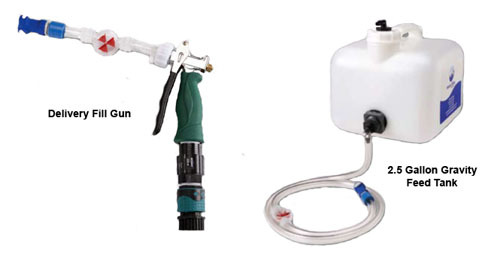 Fill Options: The BFS Battery Watering System kits includes your choice of Fill Gun or a 2-1/2 gallon tank. If you fill your batteries with water from a garden hose, then please choose the option with the Fill Gun. You will fit the special adaptor end of the Fill Gun into the mating end of the watering fill point, turn the water on, and the batteries are filled correctly and instantly every time. Do not select this option if you are on a well, or use water softeners, as these water sources can contain minerals, and/or other contaminants that can damage the active plate material inside your batteries. If you wish to use distilled water (which is preferred over tap water), please choose the option with the 2-1/2 gallon tank. The tank is a gravity fed tank that must be located 2 or 3 feet above the batteries to work effectively; each tank includes a special hose, quick connector, flow indicator and a shut-off valve. Please note these filler tanks should not be left connected to the bank of batteries for long periods of time. When the batteries are full, close the valve and disconnect the hose. Each filler system is brand and model specific to the vehicle as the watering hoses are routed for that particular car and battery design. The kit is available for many models and battery configurations in 36V (18 cell), 42V (21 cell), and 48V (24 cell). If you need a system for a custom application, give us a call and we can have it made to your specifications. Please note that both the delivery gun and the tank are shown with a BLUE connector to make the connection to the single point hose on the cart. This is the NEW style connector which is now included with all modern BFS kits. BFS originally used a gray connector. If you have purchased a new kit and gun or tank, your kit will arrive with BLUE connectors. However, if you are ordering a replacement gun or tank only for an older model kit with the grey connector, please select the option from the drop down menu below for either part with the GREY connector. The grey and blue connectors are not compatible without the use and installation of a special BFS JUMPER, which we'll be adding to our BFS Components section soon. Please take the time to view ALL pictures above. We show both the blue and grey connector versions as well as how they mate together in an effort to avoid confusion. It is your responsibility to adequately idenitfy your connector color. ALWAYS REMEMBER TO WATER AFTER CHARGING! When your batteries discharge from use, some of the electrolyte is absorbed into the active material of the plates. When you recharge them, this electrolyte is released back into the cells causing the level to rise. If you water prior to charging, you run the risk of your batteries overflowing due to this rise in electrolyte level. Once the batteries are fully charged, the level will be at its highest point, and will eliminate the chance of overflow. Please select your car model, voltage (number of cells), and battery type from the drop down menu below. If you have any questions about which kit your car uses, please give Golf Car Catalog a call at 1-800-328-1953 (828-963-6775). Please also take the time to review the BFS Return Policy and Warranty. Golf Car Catalog extends no warranty on this product above and beyond that outlined by the manufacturer. 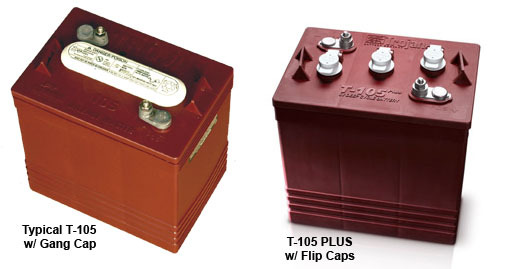 Note 1: If you have 6 volt Trojan T-105 PLUS batteries, (pictured below), you will notice that unlike the original Trojan T-105 batteries, the PLUS batteries feature a flip-open cap positioned in a diagonal orientation, and these PLUS batteries require special floats. The battery filling system needed for these batteries requires a special clip float. If your vehicle has this new style Trojan PLUS batteries, please order the option that indicates, "Trojan Plus", from the drop down menu below. Options without the "Trojan Plus" option are designed for the original Trojan T-105 batteries or battery types that are otherwise indicated. Note 2: You may order just the Battery Filler Gun and/or Water Tank separately, but they will not work unless you also have this special Battery Filling System offered here. Note 3: Please be aware that during the winter months, there is an approximate lead time of two weeks for these battery filling systems. FINAL NOTE: We of course, do not have every BFS kit available listed online. If you don't see it or have any confusion over which kit to order, please call 1-800-328-1953 prior to ordering. We can also get kits which are not shown for various Taylor Dunn products, Stealth, Kandi CoCo, AlumaCar, Stealth, California Roadster, Fairplay Eve and many others. Additionally this battery fill system may be configured to fit on RVs, boats and custom electric vehicles that use flooded-cell lead acid batteries. Pricing may vary depending on exact battery layout. Please call for pricing and specifications. 800-328-1953 or 828-963-6775.